Kavout has developed several model portfolios based on vetted and established trading strategies and augmented with AI algorithms. In this article, we present an example of our Kai Enhanced Healthcare Sector Portfolio. The Kai Enhanced Sector portfolio gives full sector exposure and concentrates on the stocks with the highest potential. Stocks are selected based on K Scores – stocks rating that is rooted in fundamental rule-based factor investing, and super-charged using machine learning models and data graph. The Kavout AI engine dynamically updates stocks ratings and generates new K Score ratings daily, predictive analytics. The portfolio strategy is then rebalanced and asset allocation optimized for both holdings and weights, to seek maximum risk-adjusted returns. We believe this quantamental approach allows us to select an enhanced portfolio of stocks within the same sector to best capture the growth cycle of the sector. Our methodology applies to all sectors. In the following example, we illustrate the performance of an enhanced healthcare sector portfolio and compare it to the healthcare sector ETFs. It shows an example of how an enhanced sector portfolio is allocated across different companies. While the optimal rebalance frequency for this portfolio is weekly, it isn’t the case for all portfolios. It really depends on the underlying model. 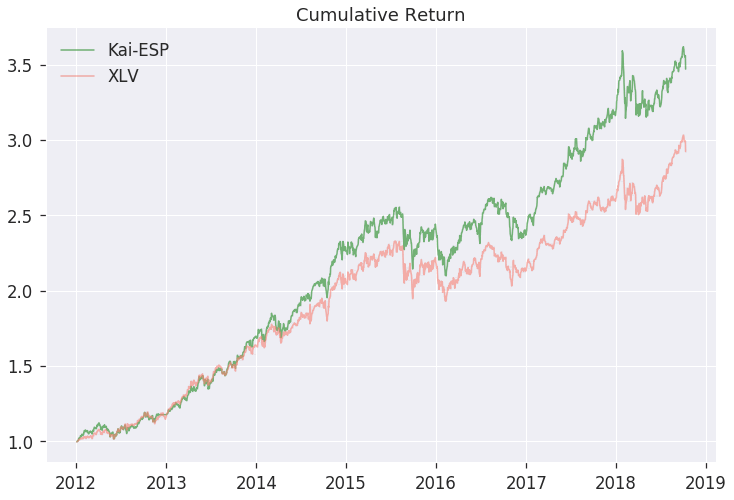 As the graph below illustrates, the Kai Enhanced Healthcare Sector portfolio has consistently outperformed the healthcare sector ETF (XLV) since 2014.